When Preet Chauhan was a child in India, she lived in a family home that included her grandparents as well as her parents. Her grandparents helped look after her; she helped them too. Loneliness wasn’t a part of the picture. Chauhan moved to Canada with her parents and brother when she was 11. Her grandparents didn’t join them until several years later. When they arrived, Chauhan knew they were looking forward to being with the family again. She hadn’t anticipated that, away from their native language and culture, they might feel isolated in Canada, or that mobility would become more difficult as they aged. Although her grandparents are doing well with family support, they inspired Chauhan to help less fortunate older people. Today, Chauhan is a fourth-year PhD student in Wilfrid Laurier University’s Department of Psychology and an award-winning researcher tackling social isolation and loneliness in older adults. The need to address the problem is great, says Chauhan. One in six older adults in Canada is socially isolated – about one million people in total. 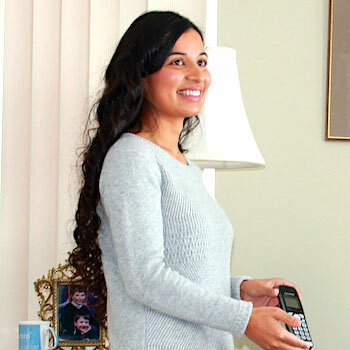 Throughout her undergraduate years, Chauhan volunteered with the Telecheck Seniors Program, which provides telephone-based support for isolated older adults in Peel Region. She provided social calls, safety check-ins and medication reminders to clients who had requested them. Though many calls were short, she could tell how much they meant to those receiving them. “To us it’s one phone call, but to that person, that one phone call means everything,” says Chauhan. After Chauhan began her doctoral studies in developmental psychology under Laurier Assistant Professor Nicky Newton, she wondered just how effective telephone support programs like Telecheck are. Unable to find much existing research, she decided to design her own, working with Spectra Helpline, which runs Telecheck. In 2015, Chauhan received a prestigious award, the International Society for the Study of Behavioural Development-Jacobs Foundation Mentored Fellowship for Early Career Scholars, which provides just 10 students around the world with three years of funding, opportunities to present research around the world, and mentorship from a top scholar. Chauhan’s mentor was Toni Antonucci, a well-known social relations scholar from the University of Michigan. With mentorship from Antonucci and Newton, Chauhan evaluated the Telecheck program through phone interviews with 31 people receiving phone services, as well as a comparison group of 50 people of a similar age not receiving these services. Chauhan employed a widely used hierarchical mapping technique Antonucci developed during the 1980s. It involves a diagram of concentric circles placing the subject in the middle. The inner circle consists of people to whom the subject feels so close, they have difficulty imagining life without them. The middle circle consists of people who are important but less vital. Members of the outer circle are more distant supports, while those outside the circles are acquaintances who are not part of subjects’ social support networks. Chauhan asked Telecheck clients to place the service somewhere in their personal diagrams. She asked members of the comparison group to imagine using the service in their current lives, then place it in their diagrams. Most of those who only imagined using the service placed it outside their support networks, although many said they could see such a service becoming more important to them in the future. Most Telecheck clients placed the service within their inner or middle circles. Chauhan found major differences between Telecheck clients and the comparison group. The biggest was in the size of their support circles. The people not using Telecheck had inner, middle and outer circles full of family and friends. Most Telecheck clients had few people in their circles and some had nobody at all. There were other differences too. Most of the people using the telephone program lived alone and generally had lower incomes, lower education levels and lower levels of physical mobility. They had more physical illnesses and, although Spectra Helpline selected only participants who were willing and mentally able to participate in interviews, a quick screening tool Chauhan used found they had lower cognitive abilities. “This research highlights that social connection, physical health and mental health all complement each other,” says Chauhan. Telephone support programs have the potential to affect all three aspects of well-being, says Chauhan. In addition to providing a friendly voice, they can connect clients with other services, such as transportation, meal programs and social activities. Chauhan expects to defend her PhD dissertation this summer. She’s not sure what she’ll do after that but says she’ll keep working to enhance the well-being of older adults. In particular, she’d like to continue to find ways to use the power of technology to connect people with each other and with the community. There aren’t many telephone support programs for older adults, despite the convenience and accessibility of the technology, but more are starting up in Canada and elsewhere. Chauhan is currently talking to AARP, a national organization in the U.S. that advocates for older people, about offering suggestions for designing, implementing and evaluating their telephone programs in the pilot stage. Chauhan is also interested in how other technologies can help with aging. In addition to her own research, she is assisting Jennifer Boger, a University of Waterloo assistant professor who is working on an artificially intelligent search engine aimed at connecting people living with dementia and their caregivers to resources. As today’s tech-savvy adults age, they will be more comfortable with using technology to improve their lives, she says. Still, Chauhan knows what’s ultimately important isn’t just the technology.